The cash-strapped can live like cultured kings in the Big Smoke, thanks to an impressive collection of free museums and art galleries, but those with just a pocketful of change have even more adventures ahead. 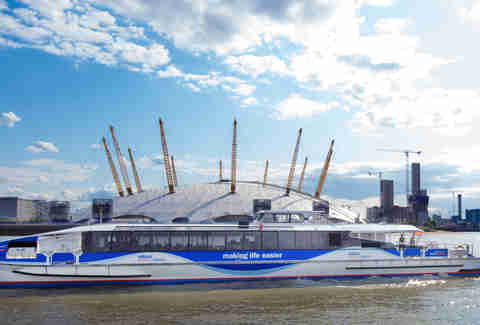 Here’s how you can sail the Thames, drink Champagne, watch West End theatre, and plenty more... for just 10 bob a pop. Surely the classiest lunch you can buy on a budget is the Bubbledogs lunch special. 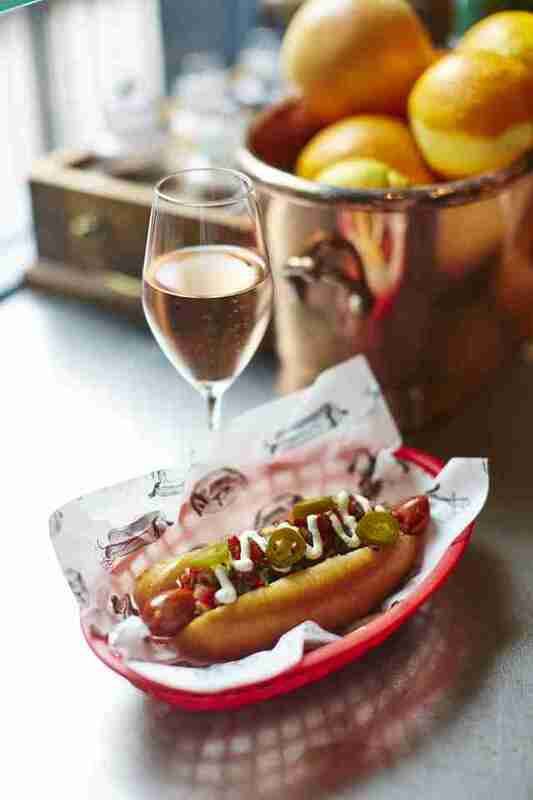 For £10, the Fitzrovia favourite offers a glass of champagne and a hotdog during the daytime for just ten pounds Monday-Thursday. That’s only slightly more than a McDonald’s meal… and infinitely more charming. This batshit crazy collection of shrunken heads, prison inmates’, dodo bones, celebrity poo, and plenty, plenty more is always worth the £5 entry fee, but it’s worth timing your visit to coincide with their monthly “Menagerie at the Museum” nights if you can. Live animals, such as Sam and Delilah the boa constrictors, Rosie the tarantula, and Huffty the blue-tongued skink will be there to greet you. This is one of London’s best pubs for a whole host of reasons: the excellent beer selection, the piano, the real fires, the cute garden. But probably the main reason is that their prices are as low as your stress levels will be after an hour in there. 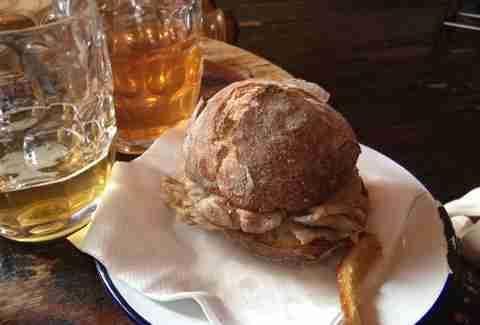 One of their excellent roast pork rolls and a pint of something hoppy will set you back just £8.80. 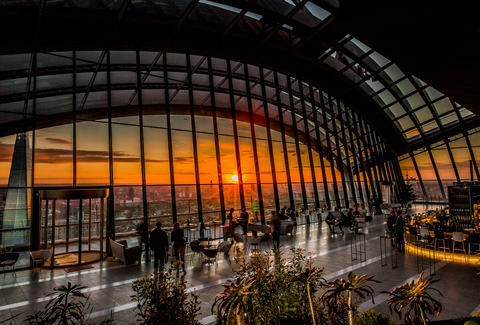 This gorgeous terrace of plants sits within the City’s own top-heavy skyscraper, the Walkie Talkie. As well as being a fair bit more impressive than your mum’s conservatory, at 155 metres up, it has some truly spectacular views. It’s free to visit, so spend your tenner on a drink from the Sky Pod bar. Get a double dose of world-class art and an unbeatable view of London’s many riverside landmarks with a trip on the Thames Clipper. The Tate Britain is a few minutes’ walk from St George Wharf, and boats leave every 40 minutes for Bankside, where you can explore the Tate Modern’s remarkable collection. Make sure you show your travelcard if you have one, as it’ll make your voyage even cheaper -- although the cost is only £6.30 without. This is as close to a rollercoaster as you’ll get within the M25. 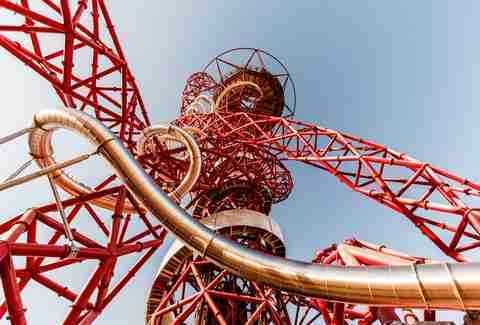 The Olympic Park’s squiggly red sculpture offers fantastic views across East London for its £10 admission price, but pay £5 extra and you can also spend 40 seconds hurtling down a silver tube that was added to the structure by German artist Carsten Holler in summer 2016. Forty seconds may sound quick, but when your bum’s in a sack and your heart’s in your mouth, it will do nicely. 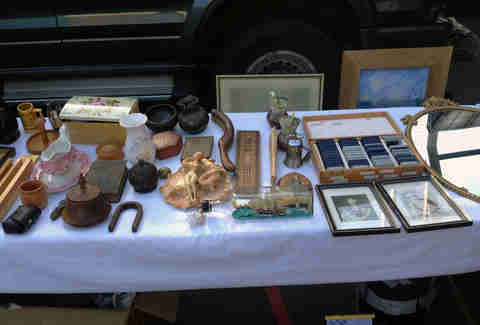 We don’t have flea markets in London… not real ones, anyway. If you’re looking to rummage through piles of old tat in search of bargains and/or potential heirlooms, then you want to be at a car boot, and Dalston’s Princess May is a gem. Expect some vintage homewares and antiques, a good scattering of records, a lot of second-hand clothes, and a whole load of rubbish besides -- for an entry fee of just 50p. Got too much tat already? Get there at the crack of dawn and pay for a walk-in stall (£10) so that you can flog it to others. Apologies to anyone this doesn’t apply to, but it’s such a good deal, it had to go on the list. 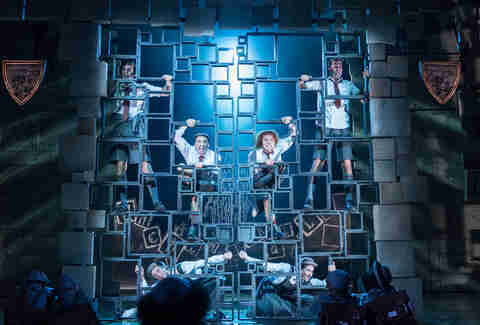 Those aged between 16 and 25 can queue for £5 tickets to see one of the best-loved musicals in the West End. They go on sale at 10am on the day of the performance, but you’ll need to be there earlier, as there are only ten available per show. Definitely worth the early start though -- even those who hate musicals have been known to tear up from sheer joy in the very first song. This truly gluttonous treat originated in Australia, but made its home in east London café Molly Bakes. 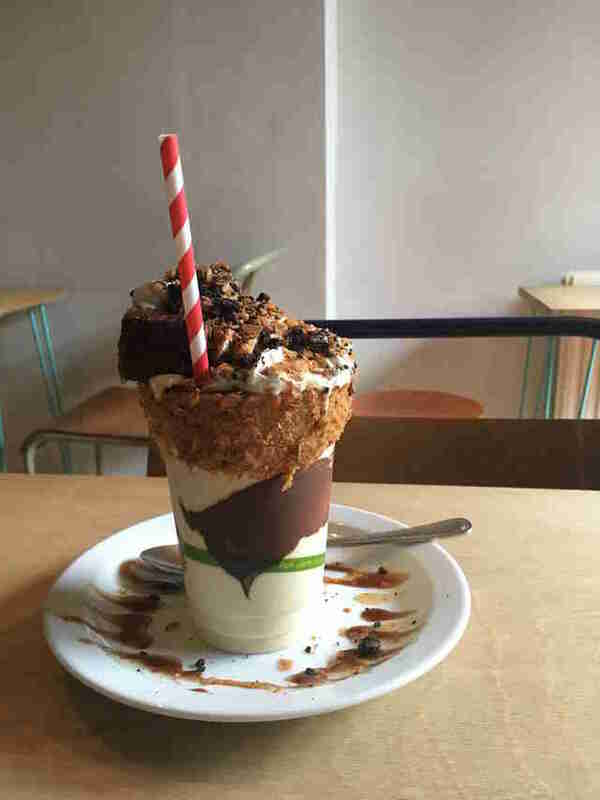 A thick, freshly blended milkshake is topped with your choice of either brownie or cookie, and a selection of sprinkles, sauces, crumbles, drizzles, and cream. Despite the low cost (£7), please share it with somebody else… just so we don’t get a letter of complaint from your arteries. Not only are Brick Lane bagels cheap and delicious, they are available 24 hours a day. Grab one on your 3am stumble home, and stick a salmon and cream cheese spare in your pocket for the morning. Tomorrow’s you will be delighted, and will have only shelled out £4.70. 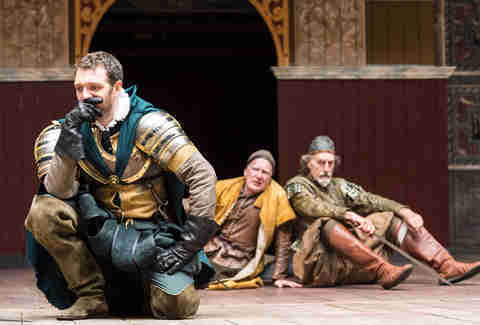 Sure, you’ll have to stand up for several hours, potentially in the rain, but there is no more authentically Elizabethan way to do theatre than getting a groundling ticket at the beautiful Globe theatre. There are 700 £5 tickets for every performance, so you won’t even have to fight for them… and you’ll get the best view, to boot. Famous Victorian engineer Isambard Kingdom Brunel’s lesser-known work was the Brunel Tunnel, a huge chamber underneath the Thames that he had hoped would become the world’s first underground entertainment complex. It wasn’t to be -- it’s now used for the Overground train network. But you can visit the amazing entrance chamber on a tour as part of Midnight Apothecary, a pop-up cocktail night in the Brunel Museum’s roof garden. As well as booze and history, you’ll get marshmallows to roast over the fire pit -- all for £5. Ashleigh Arnott is a food writer living in London. She really loves sandwiches and is never not hungry.